DA Form 7419-2 - also known as the "Exceptional Family Member Program (efmp)" - is a United States Military form issued by the Department of the Army. The form - often mistakenly referred to as the DD form 7419-2 - was last revised on August 1, 2007. Download an up-to-date fillable PDF version of the DA 7419-2 down below or look it up on the Army Publishing Directorate website. Discussion and resolution of EFMP issues. Garrison commander approval of minutes. Structures the team as a subcommittee of the installation EFMP committee. Depicts team chairperson and membership stated in AR 608-75.
performing care-giving health practices, and policy exceptions. Addresses SNAP Review Team per AR 608-75.
services to support child/youth needs. Recommendation of placement setting that accommodates to the extent possible the child or youth's individual needs. Is alphabetized by name of Soldier. Contains demographic information on DD Form 2792 and DD Form 2792-1.
Review completed DA Forms 7415. Ensure client contact logs and case records document housing and community support assessment and notification. Ensure client contact logs and case records document provision of information to help children transitioning to a new school. Ensure client contact logs and case records document compliance with standard. Ensure client contact logs and case records document assistance to families with EFMP issues and problems. Conduct focus group of EFMP families to ensure EFM services are provided. 10000.9 ACS informs EFMP families about the availability of community support services and educational resources. Review listing of support groups and advocacy organizations in EFMP section of ACS information and referral file. Ensure client contact logs and case records document provision of advocacy and support group information. Review support group agendas and group session logs. Outlines component agency responsibilities, tasks and milestones. Is monitored quarterly for implementation. *Ensure appropriate SOP addresses ACS implementation of respite care program per AR 608-75.
Review respite care provider recruitment materials and respite care provider training schedule, outline and group session logs. Ensure completed DA Form 3063 validates certified homes and placements. *Ensure memorandum of understanding/memorandum of agreement document provision of recreational and cultural programs per AR 608-75.
Review schedule and outline of programs. Interview CYS Coordinator and Community Recreation Division Chief. Ensure client contact logs and case records document coordination and provision of recreational and cultural programs. 20000.5 EFMP physician ensures that all medical providers receive training to become knowledgeable of EFMP requirements. 20000.7 The OCONUS family member deployment screening is completed per paragraph 2-1b and Appendix E, AR 608-75.
Review DA Form 5888s (Family Member Deployment Screening Sheet) to document correct completion of records. EFMP physician or trained designee is authenticating signature. Completed DA Form 5888 has MTF EFMP stamp. enrollment is warranted; otherwise indicate not warranted. If needed, DD Form 2792 and/or DD Form 2792-1 are attached. Review completed DA Forms 7246. *Ensure clinic SOP defines and states that all of the above procedures are completed in accordance with AR 608-75. 20000.8 The EFMP physician ensures that EFMP summaries are completed and distributed per paragraph 3-1, AR 608-75. Forwarding DD Form 2792 and/or DD Form 2792-1 to the RMC for coding. Receiving computer hard copy print out of EFMP Summary from RMC. 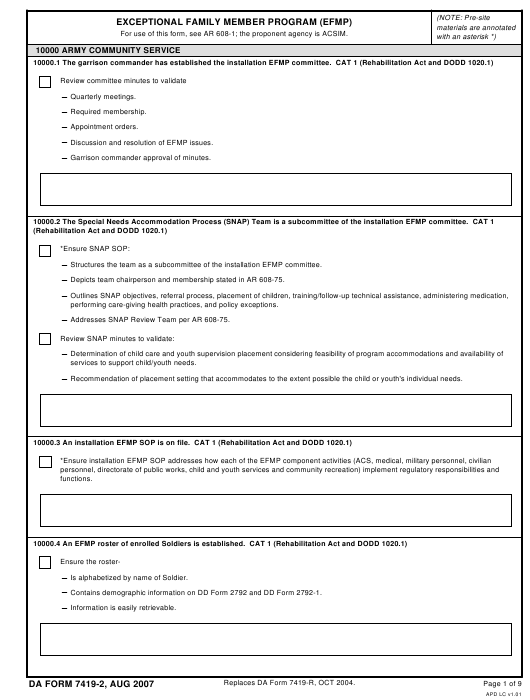 Forwarding copy of computer hard copy printout of EFMP Summary to outpatient treatment records section. Interview installation EFMP manager to verbally confirm receipt of data. *Ensure clinic SOP contains instructions in the collection and distribution of required data.